Brooks is trying to kill me. I came across this running “challenge” . . . the Brooks Run Happy Summer Challenge. The shoe company is giving away two pairs of running shoes per day for a month. Winners are randomly selected from those participting in the challenge. No purchase necessary. Odds of winning are practically zero, but better than one’s chance of hitting the powerball jackpot. At the end of the challenge a grand prize winner will be drawn . . .
At the end of the challenge, we’ll draw one grand prize winner for an expense paid trip for two to the Las Vegas Rock ’n’ Roll Half Marathon on November 17, 2013. Free running shoes? Is this Florida State University? Sign me up! 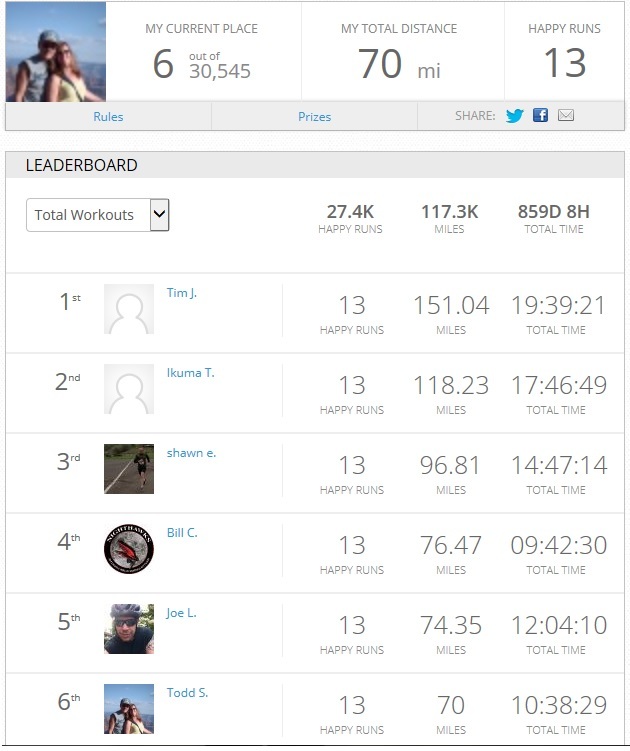 In the first few days, I was in the Top Ten of the Leaderboard, 5th out of 29,000+ contestants! There are now over 30,000. But what I didn’t realize is that this ranking system is based solely on how many days you have run and “rated” your run. You have to log in your miles, time and click on a rating icon ranging from a smiley face to things like a frowny face, an oxygen mask and a coffin. I’m just kidding about that last part. It’s actually a tombstone. Normally, I run 5-6 days per week. Most running and fitness experts recommend that you take days off to allow your muscles to rest and rebuild. But that means a day you can’t win the shoes you aren’t likely going to win anyway, and you have to watch as your name plummets down the list because you now have one fewer workout than the rest of the field. The first (and so far the last) day I didn’t run, I saw my ranking fall from 5th to 30th. I’ve slipped from 6th to 10th just while writing this because I only have 13 happy runs instead of 14! In short, the shoe company is throwing sage running advice to the wind and rewarding runners for pushing themselves too hard. You don’t need no stinking day off! Take a day off? NO SHOES FOR YOU! I usually don’t run on Tuesdays. After I watched my name plummet last week, I considered adding in a “small run” of like a hundredth of a mile. I could always run it with the next run but not include it, but I’d have my workout total to keep me on the rank list. But then my conscience got the better of me and I accepted my ranking such as it is. After all, if we runners don’t have our honor, what would we be? Cyclists or ball players on performance enhancing drugs? So this Tuesday, I dutifully got up and donned my NON-BROOKS running shoes and ran. I was only going to do one mile–slowly. It would almost be like taking a day off, and yet I’d still have my negligible chance to win some shoes. I ended up doing 3 slow miles, but my conscience is clear, even if my muscles ache.